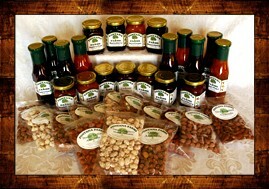 Fontana Farms makes homemade fruit preserves and sauces with only the finest natural ingredients available. Located in the heart of the Central Valley, Fontana Farms is a family run business in every sense of the word. The family cares for the business entirely, whether it be tending to the orchard, sales at the Farmer's Market or preparing their celebrated Fontana Farms preserves and sauces. As the Fontana's business has evolved, they have taken great care to maintain their original homemade qualities.